Certainly not a bad Halo game, but one that succeeds despite its innovations, not because of them. With multiplayer the high point, Halo 5 is worthwhile, if not always truly convincing. Halo 5’s slightly obnoxious, Matrix-aping opening cutscene depicts Jameson Locke’s Osiris Squad leaping, tumbling, and vaulting down a snowy mountainside, taking down random, arbitrary designations of the vast army ahead of them in a manner akin to gun-toting luchadores. It’s flashy and dynamic, but ultimately delivers little of meaning, and doesn’t seem to entirely grasp the point. It’s a perfect introduction to Halo 5’s campaign. This isn’t a bad game. And when it fails, it does not fail for the reasons many suspected. The campaign’s permanent, four-character squad does not particularly intrude upon the flow of combat, as feared - except when part of the inanely ill-considered, AI-(mis)managed revive system. Across-the-board weapon scoping? Halo’s combat has rarely been built for scoped play, and things haven’t changed enough in Halo 5 that you’ll actually feel compelled to zoom terribly often. 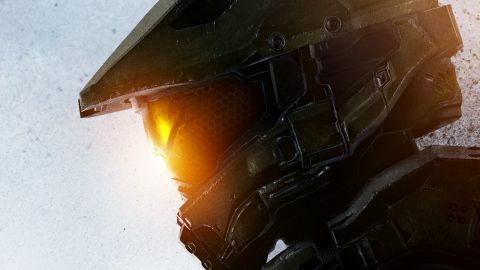 But that disconnect between intent and practical purpose is Halo 5’s problem all over. Because while Halo’s traditional, core gameplay still imparts a rather high minimum level of enjoyment, Halo 5’s attempts to evolve it deliver a great deal of promising, isolated ideas, but a notable lack of cohesion. Simply, it’s a game that’s at its most interesting and fresh when it’s at its least successful. The new version of that combat model, for instance. On its own, it’s a brilliant design, an entirely logical, vertical extension of Halo’s gleefully freeform lateral combat. It applies a typically buttery and responsive treatment to the act of fighting upward and downward, the near faultless mantling system turning many an early environment into a giddy jungle gym of high-velocity lethality once your brain clicks to the new possibilities. You’ll duck and whirl around multidirectional gunfire as normal, whipping in and out of cover to recharge shields, Halo’s rhythmic, almost musical combat singing nearly as loud as it ever has, albeit at a rather faster tempo. But then you’ll seamlessly hoist yourself up onto a crate, breaking the traditional back-and-forth, cat-and-mouse flow with an airborne flourish, leaping high above the skirmish to crash down upon your prey with a powerful, directed ground-pound. And then you’ll spot a few scattering grunts. You’ll instantly home in on one with a rocket-powered dash-punch, before whirling around and shotgunning his friend in the face. It sounds good, and it is, but before long you’ll start to notice that neither the level design nor the enemy AI consistently syncs up with your own capabilities. In terms of opposition, for the majority you’ll be going up against the same Covenant and Promethean units as in Halo 4, all built well for satisfying, intimate engagements – the latter still lagging somewhat behind – but not terribly well-tooled for fighting on the y-axis. Opposition too often remains inert in its terrestrial comfort zone, meaning that you’ll find little engagement - a few extra token snipers aside - when the game’s splendidly intricate, branching routes take you entirely above and beyond. When things work, Halo 5 can be a blast, but all too often it is indeed rather lonely at the top, enemy interest seemingly limited to its immediate vicinity, which rather breaks the illusion of your presence. The later stages are much more comfortable, falling back into the kind of focused level design that the series’ encounters have traditionally thrived on. In fact, this being Halo, ‘comfortable’ is too faint praise. When things come together, and the new control possibilities slot into the action as genuine augmentations rather than well-meaning but awkward garnishes, the result is tactile, resonant fun, even if the needlessly increased pace does rather reduce the game’s tactical smarts. But these pleasures come along with the uncomfortable irony that Halo 5 is operating at its best when its most unique features are least prevalent. Such sentiments of confused purpose bring me neatly to the campaign's final stumble, which similarly stems from a lack of finesse. The issue? Story. Or rather, Halo 5’s lack of one. Following Halo 4’s transitional tale, this is the first act of a new trilogy, but it actually feels far more slight than its predecessor. The problem is one of padding and pacing. Simply, Halo 5 makes the mistake of delivering the first act of a bigger story with no regard for functioning as a story within itself, the meaningful plot it does have really only enough to fill a single game’s first few hours. As such, the majority of its events are ultimately meaningless filler and misdirection. That lack of consequence is the route of all of the story’s problems. By the time of the game’s climactic, heavily telegraphed events, it’s painfully apparent that the wider story would have played out the same whether or not Locke and the Chief had even got out of bed. Fortunately, things get much better when you venture online. While the new combat mechanics rarely get a look-in due to impracticality (the dash-punch takes too long to activate, and the ground pound leaves a Spartan far too exposed in mid-air for far too long), even traditional Halo multiplayer is still a very hard experience to beat. The versatility, malleability, and sheer scalability of the core shooting just translates into so many richly varied, cerebrally satisfying situations and game-modes that there’s nigh-endless fun to be had here, whatever your preferences. That scalability is responsible for Halo 5’s most obvious new addition. Warzone, the new 18-24 player team mode, is effectively Halo’s answer to Battlefield. Playing out over vast maps taking in all manner of geographical and architectural variations – and riddled with intricate, alternative routes – this is a wider, yet more purposeful, evolution of the old Big Team Battle set up, with more options, more strategy, and far more scope. The genius of Warzone is in the sheer number of ways in which it’s possible to score points. With Spartan Kills, base capture, and AI ‘boss’ threats all on the table (with differing rewards for each) things get much more thoughtful than you’d expect. Bosses, for instance, can absorb a huge amount of damage, and take down individual Spartans in no time, requiring a fairly large, well-organised chunk of either team’s resources to kill. Pull it off though, and the scoreboard rewards are huge. As such, the wildly varied moment-to-moment action runs in tandem with a wider meta-strategy. Do you continue to try to liberate that contested base? Or can you make more of an impact if you pull away, possibly forfeiting the installation for a chance to make a difference against that Covenant general on the beach? How’s the scoreline looking? How formidable is your team’s hardware – made up of player-selected weaponry and vehicles, furnished by unlockable, single-use REQ Cards - looking? Just what is the right thing to do, right now? Every interaction in Warzone is enjoyable, but the constant decisions over how best to maximise your immediate effectiveness make for a hell of an engaging overall experience. Elsewhere it’s business as usual, but in Halo multiplayer, ‘business as usual’ means ‘rather darn excellent’. The new arena maps flow and funnel the action as marvellously and invisibly as a good multiplayer map should, and the returning modes – from the lightly strategic power-up control of Team Slayer, to the elegant, headshots-only duelling of SWAT - are as gratifying as they ever have been. Current star of the show though, is Breakout, a 4v4, no-shields, radar-free team elimination mode that’s every bit as tense and demanding as it sounds. Fast, deadly, and entirely captivating, if you have the nerves for it you’ll find few more exhilarating online experiences this year. Halo 5 multiplayer is good. Very good. And so far, in stark contrast to the ill-fated Master Chief Collection, it performs rather flawlessly. Had it joined a better campaign, we could have been looking at a stand-out Halo, even if not an all-time classic entry. As things are though, it provides the clutch save that elevates the overall package to recommendation. Description Master Chief has gone missing and it's your job to find him.